Horizon Zero Dawn 2 confirmed as actress Janina Gavankar tells a fan she knows "some secrets"
Guerrilla Games hasn't announced it yet but you know Horizon Zero Dawn 2 is coming, I know Horizon Zero Dawn 2 is coming, and actress Janina Gavankar knows Horizon Zero Dawn 2 is coming. She seems to actually know, though, and she probably said more about it than she should have during a livestream of her walking the halls of Star Wars Celebration 2019 on Thursday. 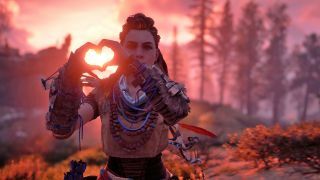 Gavankar voiced Tatai in Horizon: Zero Dawn's Frozen Wilds DLC - not a huge role, but big enough (and left open-ended enough) that it wouldn't be surprising for her to reappear in a sequel. When talking to a fan who came to Celebration in cosplay as Gavankar's character from Star Wars Battlefront 2, the conversation drifted to Horizon Zero Dawn (via Reddit). "It's incredible. Just wait 'til you see the sequel, you're gonna die," Gavankar said. "I know some secrets, you're gonna die." Not much room for equivocation there. Gavankar was clearly talking about Horizon Zero Dawn 2 being "the sequel", a game that doesn't officially exist despite broad assumptions of it being the next project for Guerrilla Games. And her talk of "secrets" makes it sound like her character is involved in some heavier plot elements, or at least that Guerrilla has clued her in to more of the overarching story beyond Tatai's role. I've reached out to Sony to see if it can offer any official comment on Gavankar confirming Horizon Zero Dawn 2 and I'll update this story if and when they get back to me. Until then, let your dreams of frolicking once more amongst the robo-dinos feel a little more real tonight. Horizon Zero Dawn earned a place of honor our list of the best PS4 exclusives, see what else we've ranked up there. And take a look at our video guide of what games to look forward to in 2019.